1 - I thought all ALK designs were downloadable as DIY projects. The DIY design download section has been removed. Unfortunately, because of one unscrupulous vendor who has seen fit to adopt my designs as his own claiming: "All it takes is a couple of little changes and they are no longer your design. These calculations are available to anyone on the Internet. 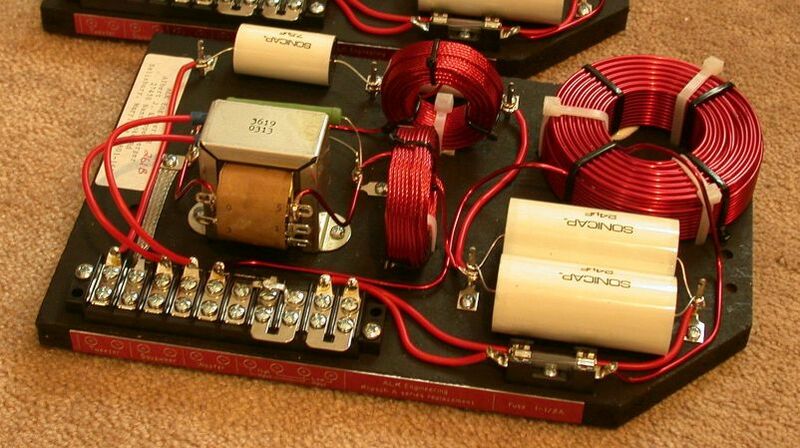 You don't own the idea of using inductors as low-pass filters, caps as high-pass filters, autotransformers as attenuators, and resistors for swamping.",.. I need to end my old policy of openness. Any designs that are not already released to the public will be kept proprietary. This kind of "little changes" are not made to improve on a product but rather are to justify the theft of another person's creativity. The statement itself is clear evidence that he is doing just that! Another big reason for not supporting DIY projects is the difficulty of determining who is really qualified to build crossover networks and those who believe they are but really are not. There is a lot more to it that just being able to solder! For example, here is what a totally incompetent builder will do even to a kit which includes step-by-step instructions! One reason I no longer offer kits. I don't want my name associated with this sort of mess! NEVER AGAIN! Here's another example of what I want to avoid. He takes my design and decides to make a showpiece using the kind of layout techniques used back in the 1930 era! 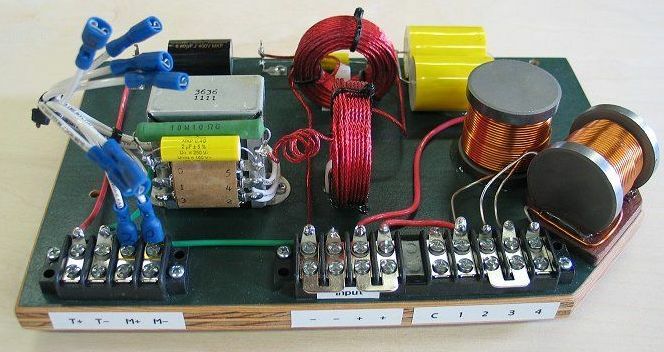 It looks like an engineering prototype "breadboard" done to verify that a design works before production! He believes he knows more about what parts should be used in my designs than I do. He even goes so far as replace the foil resistors in my tweeter attenuator with foil resistors (??) and proclaims how much of an improvement it makes. This is a clear example of what I call "O-D"ing on placebos! If you want something to sound better, IT WILL! I don't want my name associated with it in any way! NEVER AGAIN! Here's one that is to horrible to describe! BUT == Here's an exception. The "Super AA"! 2 - I have some good speaker parts. Will you design a crossover for me? Designing a crossover network, even if you have the specification sheets on every component is not easy. It requires that I have the COMPLETE speaker, in the cabinet, for testing. Here is a Klipsch forum thread describing the development of the network for the Klipsh Forte I. It should show you what is involved. Read more. 3 - What's the theory behind extreme-slope crossover networks? A paper describing crossover networks similar to those shown below having slopes on the order of 120 dB / octave in a Belle Klipsch is downloadable here. The article explains their benefits which are improved stereo imaging and a widening of the "sweet-spot". The article also investigates such factors as filter ringing, group delay, driver interaction and time alignment. (by Al Klappenberger). 4 - Does the "swamping resistor" waste amplifier power reducing efficency? To the idiots who insist that the "swamping resistor" used in ALK network circuits to set the midrange level absorb power reducing the efficiency of the speaker, consider this: A loudspeaker's efficiency is defined as the loudness in dB sound pressure level at 1 meter from the speaker when 1W of power is applied. This is usually done with 2.8V applied. The midrange is always attenuated to match the woofer, which determines the efficiency. No matter if the midrange is attenuated with an L-pad, a transformer alone or a transformer and swamping resistor the efficiency will measure the same with 2.8V applied! You have intentionally adjusted it to be so by attenuating the midrange to match the woofer! A swamping resistor or a resistive L-pad absorbs the extra efficiency of the midrange that you don't need. With a transformer alone, as with the Klipsch network designs, the impedance seen by the amp rises to reduce current, and therefor the power, drawn form the amp instead. This is undesirable because it does bad things to your amp and to the filters in the network. Energy wisely used for a specific purpose, in this case, to give your amplifier a constant load, is NOT wasted power! The swamping resistor is a win-win situation in all respects. A paper explaining the theory behind the use of an autotransformer and swamping resistor to allow adjustable attenuation of drivers in a crossover network. 5 - I hear the K55 squawker driver will not go up to 6 Khz. It has been suggested that the squawker to tweeter crossover should be changed from 6000 down to 4000 Hz. The claim is that the early K55V drivers (those with push-pin connections) will not reach the 6000 Hz crossover. This is an exaggeration. These early drivers simply have a rough frequency response in the 4000 - 6000 Hz area. The later K55V and K55M drivers do not have this problem. The true improvement heard when the crossover is lowered to 4000 Hz is the tweeter taking over from the outmoded stock K400 mid-range "squawker" horn between 4000 and 6000 Hz. You will realize a much bigger improvement in sound quality by replacing the K400 horn and retaining the 6000 Hz crossover in spite of the driver roughness! In fact, it is often the case that the K77 tweeter will not reach down to 4000 Hz requiring that it be replaced. We believe the best course of action is to upgrade the K400 horn first with a better and retain the 6000 Hz crossover. The next step would be to upgrade the crossover network but retain the 6000 Hz crossover frequency. We offer the ES5800 or AP15-6000 networks for this purpose. If you do choose to lower the crossover to 4000 Hz and change the tweeter, we also offer the ES4000 and AP15-4000 versions. These are far superior to the rudimentary 4000 Hz modifications tacked on to the stock Klipsch networks offered by another well known vendor! At a later time the K55 driver can be replaced to solve the rough response of the early K55 driver. Mr. Klipsch stated that this roughness is not likely to be audible. The improvement you will realize by upgrading the K400 horn certainly will be though! 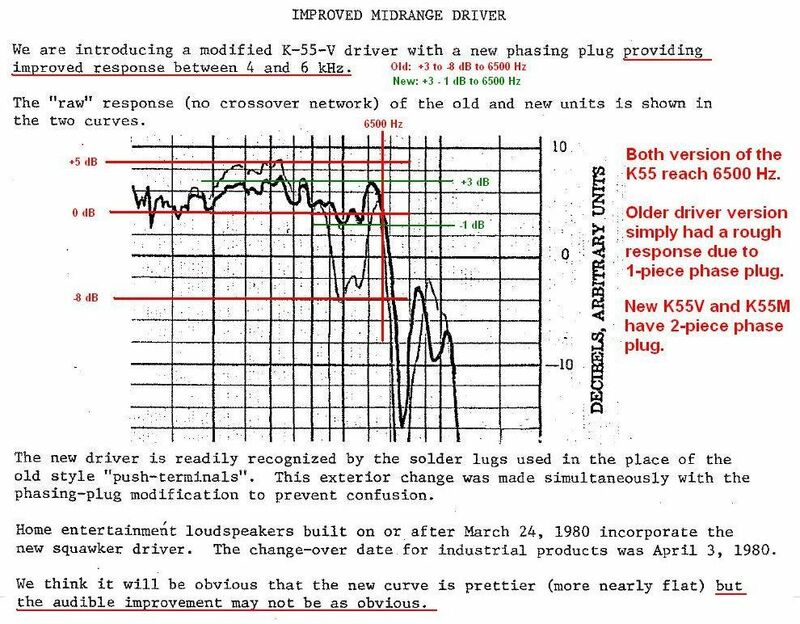 Here's what Mr. Klipach had to say about the K55 driver roughness: Dope from Hope, April 30, 1980. It should also be noted that the roughness of the early K55 shown is certainly the worst case. The majority of early K55 drivers tested are not that bad! 6 - Should I move my squawker / tweeter crossover down to 4000 Hz? You may have heard that moving the crossover from 6000 Hz down to 4000 will improve the sound. This is true only if you retain the stock K400 mid-range "squawker" horn. The speaker simply sounds better because the tweeter is doing the work rather then the drastically outmoded K400 "headache maker" horn! The horn itself (not the K55 driver) should be replaced with a modern wood tractrix horn. You should do this FIRST, before you upgrade the crossovers! Another reason not to move the crossover down is the lower limit of some stock K77 tweeters will not handle a 4000 Hz crossover. The is particularly true of the round-magnet AlNiCo K77. It would require replacing the tweeter, which should be the last item on the upgrade priority list. The K77, especially the later square magnet version, is not a bad tweeter! 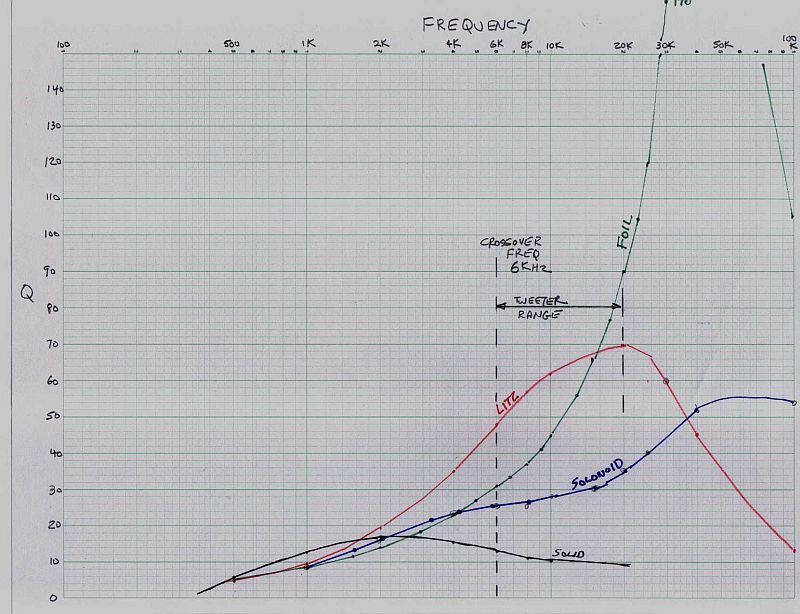 Here is some inescapable logic on the matter by Dean Wescott (I quote from his web site ... ) "If Paul Klipsch had wanted or thought a 4500Hz crossover was a better solution, he could easily have chosen it. The original University T-35 tweeter had a recommend crossover point of 3500Hz (hence, T-35), and many were using it in just this way with the recommended 12dB/octave filter. However, PWK was primarily interested in two things: higher power handling and getting as much musical content out of the K-5-J midrange horn as possible. By raising the crossover point to 6000Hz, PWK was able to achieve both. PWK said "we live in the midrange", and he wasn't kidding, wrenching almost four full octaves out of the University SAHF and K-5-J horn. Later, he would get to take another stab at it, now with a much better driver and horn. Again, PWK stays with the 6000Hz crossover point. Admittedly, response curves show a driver that would appear to be happier crossed over a little lower, but given a choice, he stays with the higher crossover point. Some would have us believe that the sub-par performance of the K-77 tweeter forced him to accept this "compromise", however, he could easily have went to a lower crossover point, used an 18dB/octave filter on the K-77, and still maintained 75 watts of power handling with his 104dB/watt loudspeaker! For 60 years the large Heritage loudspeakers kept the same crossover points, and I believe it was because PWK knew what most good loudspeakers designers know -- the worst place for a crossover point is where the human ear is the most sensitive to changes." Here's another key into PWK's thinking: He always wanted a 2-way Klipschorn. That clearly tells us he wanted a single horn to do everything above 400 Hz. Not a crossover at 4000 Hz. or 6000 Hz, but INFINITY! No tweeter at all! 7 - What about optional capacitors? ALK networks are built using capacitors most appropriate for their particular function in the network. I do not make substitutions. Quality name-brand metalized propylene capacitors in the "forward signal path". 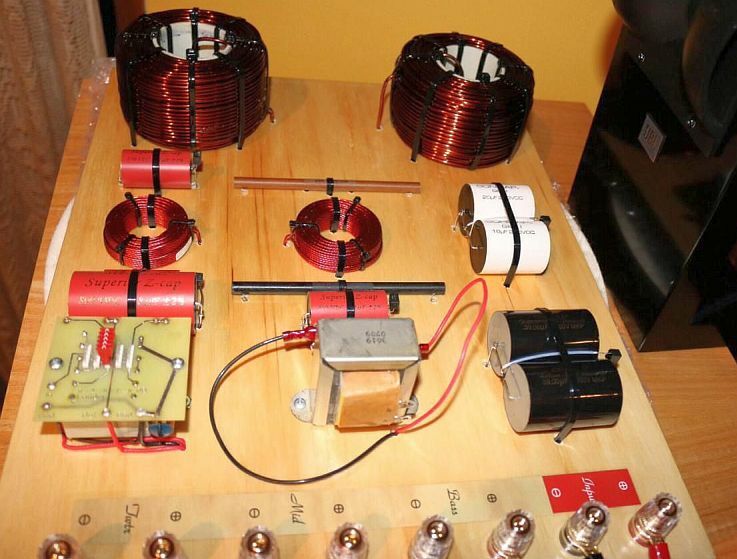 That is, capacitors in "series" that you actually listen through. This will usually be highpass filters. Solen "FastCaps" in "shunt" locations which function to bypass sounds that are to be stopped by the filter. These will be wired to common ground in lowpass filters. Capacitors are only acceptable that have low loss. Loss in any capacitor gets less at low woofer frequencies. This allows the use of "Mylar" types in woofer filters. Capacitors connected directly to an inductor to form a "notch" can be higher loss because the inductor determines the loss of the total circuit. Inductor loss is easily 10 or more times that of capacitor. Filters that are properly designed require part values that are clearly defined by the design. I only use those that are less then plus / minus 5% of the value required. The Claritycaps I use are within 3%. I computer match capacitors in pairs with sets located at the same position in the left and right crossover. To keep costs down and to make matched sets, caps of identical types are purchased in quantity. The more you have of a given cap the closed the matched pairs will be. A large quantity of +/-5% caps will usually yield pairs matched within +/-0.2% of each other. Poorly designed filters that have rough frequency response curves will be smoothed out by high loss components. Correct designs do not suffer from this problem allowing low loss components to reduce insertion loss increasing efficiency. Using capacitors with high loss, such as paper in oil types, simply reduce efficiency. ALK network designs do not need "crutches" like that! Often customers will ask for higher quality caps in an economy design which just runs the price up to that of a more advanced design which will have the better caps anyhow! This is particularly true of the "Cornscalla-Wall" network. Finding sources of alternate brand parts is time-consuming, expensive and often confusing! 8 - Should I Bi-Amp my speakers? 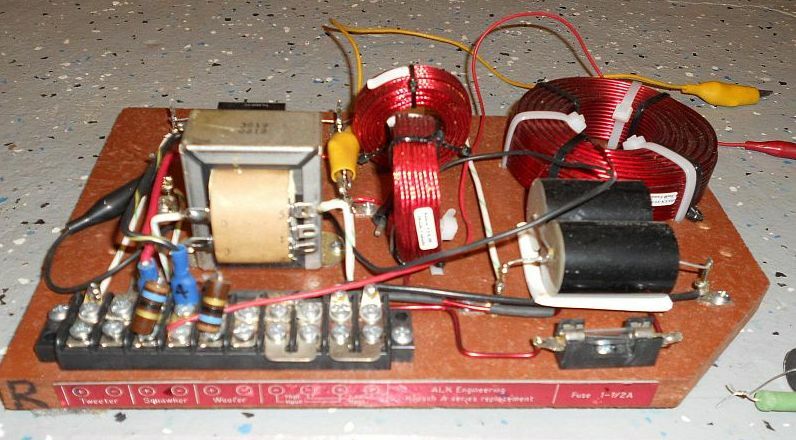 Using a separate high-power solid state amp to drive the woofer and a smaller vacuum tube amp to run the midrange and tweeter is called "Bi-amping". Bi-Amping has advantages, but if you are interested, you must do careful research to be sure you understand how to do it. It is very easy to do it wrong! We do make crossover versions that support Bi-amping. Look here for a Klipsch forum thread on biamping a 3-way speaker. 9 - Can I change the crossover frequency of an ALK network? Each part in a properly designed filter has a very specific value. In order to change the crossover frequency it is necessary to change EVERY part value. It's referred to as "frequency scaling". Doing this to an existing network leaves nothing left but the mounting board. You might as well start over and build new network! In the case of 1st order (6 dB / octave) networks, the slope is so gradual that moving the crossover frequency accomplishes nothing. This is why they are "universal". The acoustic characteristics of the drivers overwhelm the electronic crossover frequency. It's just not worth doing! This Klipsch forum thread will explain in detail: Why is the ALK Universal network "universal"
10 - Why can it take up to 8 weeks to get the crossover network I ordered? I order parts in quantity to keep costs down. This means I need to accumulate a list of customer orders before I can order parts. Each list becomes a production "batch". I compile the list while I am build the networks from the previous batch. I offer a wide catalog of networks which makes keeping quantities of expensive parts unique to only one design in stock impossible. I have no assembler to help me. I build every network MYSELF. To keep from going nuts I do not build in marathon sessions. I work in "steps" on each network set. For this reason I don't really know how long it takes to build a specific network type. I usually do one or two sets a week depending on the complexity of the design. ES networks take longer! The build time for gentle-slope networks is much shorter. While I build networks I compile the customer waiting list for the next batch. Each "batch" resembles a rotating cycle without a fixed time period. The timing depends on the number of orders in the previous batch. Some parts suppliers take longer to deliver than others. A production "batch" begins when all the parts are in. Some parts suppliers will hold up shipping items they have in stock until back-ordered items are available. Every shipment has to be evaluated to see if other parts can substituted, if partial shipments are justified or if I can get the other parts from other sources. It can get very confusing! I have no heated area to make the network base boards. I cut them in my garage and paint them outside. I am often slowed down by the weather. ALK Engineering is a home-based business. 11 - Do your crossovers require a break-in period when new? The phenomenon of "break-in" is a myth. It's your ears that is breaking in! When you make any change in your speakers you will invariably change your perception from normal listening to "critical listening". This is when you stop listening to the music and start listening to the speakers. When you do this you will hear only what you want to hear to the exclusion of all else. Gradually, over time, you will switch back to listening to the music again. THAT is the break in period in action! The crossover networks have not change at all. You are simply getting used to the new sound. 12 - Why is "constant impedance" necessary? The short answer is It's not. Its simply an advantage. 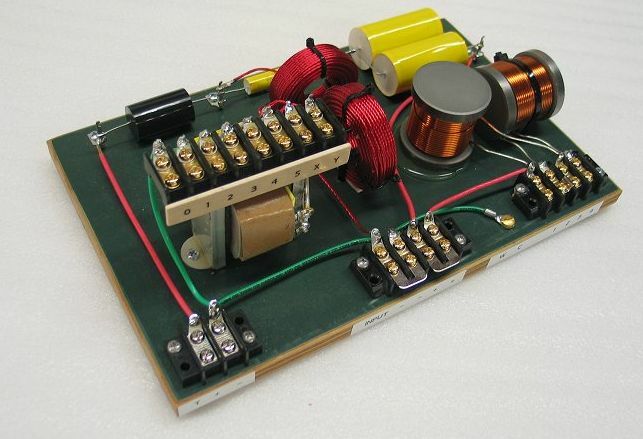 Providing a stereo amplifier with a constant 8 Ohms load is not actually required. Very few crossover networks designed by others are constant impedance. The stock networks for Klipsch Heritage speakers is all over the place. Some cause 8 Ohms speakers to look more like 70 Ohms in the midrange! The actual merit of a constant impedance is that it is the mark of a properly designed filter. This is a lesson learned through years of experience designing filters a microwave frequencies. With stringent requirements on "return loss" at microwave frequencies you quickly learn to do it correctly. There is simply no good reason why a network should NOT have a constant impedance! The fact that good amplifiers with high damping factors can handle bad loads is no more a reasonable argument for poor designs then a highway engineer would claim that a road should have lots of curves and bumps simply because cars have steering wheels and shock-absorbers! Another way to put it is that a network that provides a constant impedance will sound better, not just directly because it loads the amp with a constant impedance, but because it is a correctly designed network. On the other hand, if you have an amplifier with poor damping factor, like a 5 Watt SET, It will operate much better if it sees a constant impedance load. The frequency response can actually follow the load impedance curve. 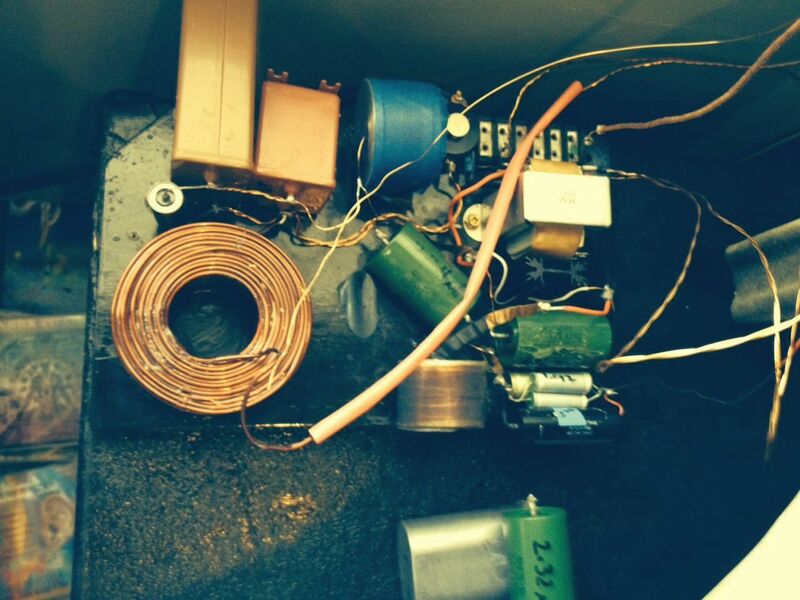 13 - Should I use Foil inductors or Litz wire inductors? The short answer is Litz! The measure of quality of an inductor is "Q". It is a measure of internal loss at a given frequency and is defined as X / R or inductive reactance divided by equivalent series resistance. The greater the Q, the lower the loss. In a crossover filter, the Q must be optimized at the crossover frequency. That is the point of maximum "stored energy" and the point of peak "group delay". This is were component losses do the most damage. The plot of the tweeter filter of the ES5800 network shows a considerable "sag" at 6-7 Khz (red trace) compared to the same filter with a perfect inductor (green trace) but not so much at 20 Khz. The red plot was assuming a constant inductor Q of 45 at all frequencies. In the real world, the "sag" at 6 KHz would be more exaggerated because the Q of the Litz inductor comes to a peak at 20 KHz. The foil inductor would be worse yet since it's Q peaks at roughly 50 KHz! The chart below shows the "Q" curves of several inductor types wound of solid wire, Litz wire and foil. The chart also shows the frequency range covered by the tweeter (6-20 KHz.). It is over THIS AREA where the inductor must work best. It is clear from the chart that the foil inductor has far higher Q then any other type but at a frequency FAR ABOVE the tweeter frequency range. The Litz wire inductor is the CLEAR CHOICE for the filters of a crossover at 6 KHz. The foil inductor is not only a higher loss element at 6 KHz, it is also expensive! Forget foil inductors! Also: The plot also tells us that inductors used in woofer filters should be wound of SOLID wire. To make matters worse for the foil inductor, its inductance value is not stable with frequency. This plot compares a 0.20 mHy Litz inductor to a 0.20 mHy foil inductor. The foil inductor is 5.5% low in value at 6 Khz. This is more than enough error to mess up a correctly designed filter! The Litz inductor measures 0.2 mHy at all frequencies. 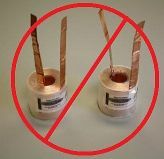 Forget foil inductors!